We won’t be stopping every other day, I promise! But it’s not every day that we find ourselves in such a vibrant area, with so much to see and do, and with family and friends as well. We are trying to take advantage of being so close to the city, while avoiding cycling in the rain. Tuesday morning we both woke up late, around 11am. A few days ago, we began entertaining the idea of cycling straight to New Orleans for the winter, where we can work as pedicab drivers and in a bike shop, instead of cycling down the coast to Fort Lauderdale first. Since boats generally don’t cross the Atlantic until springtime, we will likely have to stay in the states for the winter. Why not go directly to New Orleans, where we know we have work, before cycling to Florida in the spring (preferably after the Mardi Gras marathon) to find work on a boat? It will mean we need to start thinking about adjusting our course in a more westerly direction. We discussed travel plans and towns we’d stay in along the way for a bit, and then figured out how to take the bus and metro to head into the city for the day. Upon arriving in DC, my first priority was getting food (as usual). Phil wanted to see the museums, and since they were closing at 5:30, we decided to look into those first- but not before I bought some food from the first food truck (and only traveling culinary carnival) in the city. I enjoyed a delicious pumpkin and chick pea curry with basmati rice and a mango lassipop, while Phil started touring the Air and Space Museum. The next museum we visited was the Native American museum (actually called National Museum of the American Indian). Once inside, I found my way straight to the cafe, which was filled with Native American cuisine from all regions of North and South America. The food all looked so good, but was so expensive. I sampled a few things and ended up spending way too much money on a cup of pumpkin soup, wild rice/watercress salad, and guava tapioca pudding. I shared this with Phil, since I didn’t want to fill up before we actually made it to any of the places recommended by our friend, Christina. 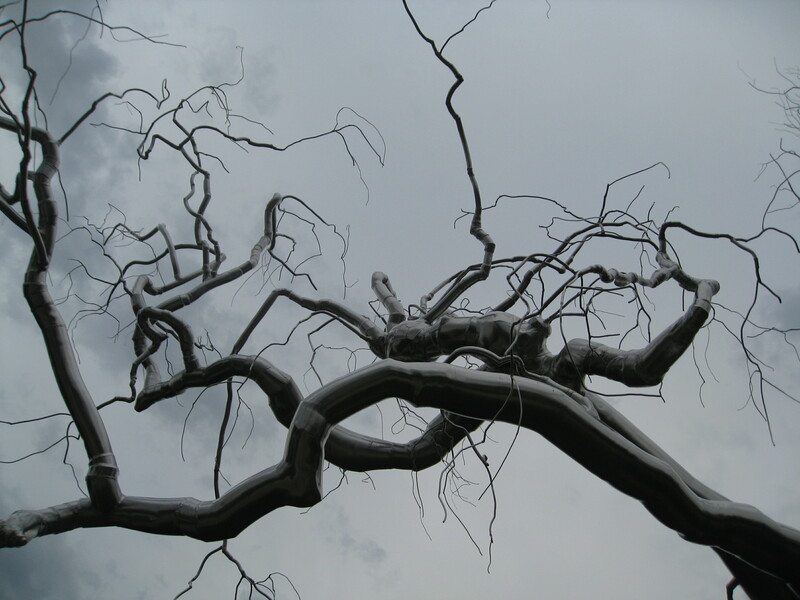 On the way to the Museum of Natural History, we walked through a sculpture park, where I took a photo of a silver tree. Sadly, this is the only time I remembered to use my camera that day. I really have been trying to take more photos for the website! The Natural History museum was my favorite, but we had the least time to spend before everything closed and the guards began shuffling everyone out. From there, we walked around to Eastern Market, where Christina had suggested we go for food and books, but it all appeared to be closed for renovation. We walked to another of her suggestions, Good Stuff Eatery, where Phil ordered a burger and I ordered a pumpkin milkshake. Looking back on everything I ate during the day, I guess I was really in the mood for pumpkin. After this, we walked to Co Co Sala, a restaurant/chocolate lounge & boutique. Charles, the bartender, was helpful in deciding what to get and very friendly, giving Phil a drink on the house. I was particularly impressed with his ability to spin a menu on one finger whilst simultaneously engaging in conversation. I started with a chocolate martini and an exquisite dessert that involved dark chocolate mousse, salted caramel and dark chocolate gelato. If I didn’t consume enough calories from that, I topped it off with a small plate of wild mushroom and tomato risotto. Feeling sated, we departed the restaurant. Phil was going to meet his friend Lauren, who lives in DC and had just returned from an interview in St-Louis, so I needed to catch the metro and bus back to Annandale on my own. I needed cash for the bus, so I ended up spending $3.00 to withdraw from an ATM, and then had to spend money at the nearest store to make change for $20. In my haste to catch the metro, I got on the wrong one. Or I got off at the wrong stop. Either way, when I got out of the train, I had missed the last bus by almost an hour. There were two other bus lines that went to Annandale, but they left from a different metro station, so I had to run about a mile to another road to catch an entirely different bus, so I could eventually get on the same bus that I had ridden on the way into the city. Without my smartphone, I never would have figure it out. Then again, if my phone hadn’t been threatening to shut down because of a low battery, I probably would have gone to the correct metro stop initially (I had turned my phone off before getting on the metro because I was afraid it would die). I finally made it back to Rosheen’s house around 11:15pm. Posted on 27 October 2011, in Bicycle Touring, Providence to New Orleans. Bookmark the permalink. Leave a comment.